All garnets give courage and energy, but beware of the passionate love which can give way to hate through jealousy ! These stones sharpen the imagination, help prevent depression, and correct impure thoughts. 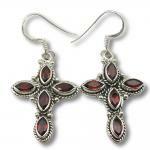 All those who suffer from rheumatism or arthritis should wear garnet.